Italians are well-known for a lot of their inventions, but one of them stands out greatly in our modern society. That is the espresso machine. The first ever was invented in the picturesque town of Turin, in Italy, during the height of the steam-powered industrial revolution. As any Italian would do, the inventor of the machine – Angelo Moriondo tried to implement current technology with food and beverage improvements and by doing that – the espresso was born. The news about his invention spread like the smell of coffee early in the morning, and surely everybody followed it. Fast forward some 150 years and you can now enjoy coffee from some of the best espresso machines from the comfort of your own home. If you’ve never had an espresso machine, the whole process of choosing your first one might be a little challenging, as today’s market is literally swarmed with hundreds, if not, thousands of models, each having its own unique features and differences. This is exactly the reason behind this buyer’s guide. We’ve already done the hard work for you by going through of most of the best models out there and handpicked the top 5 among them giving them a thorough review. On top of that, there are countless of advice and useful information on this page which will help make your final choice easier. To kick things off, here is a little comparison table between our top selected models. Really, no amount of words can describe how well Breville have managed to put this machine together. The BES920XL does everything right, from looks, materials, all the way to the quality of the coffee in your cup. It is suitable for both home and professional use, although it comes with a more of a professional price tag. In this price range (and even from the more expensive ones) this is the definite king of espresso machines. This was a pretty close race for two models, so we just chose to review them both, ranking them first and second place. 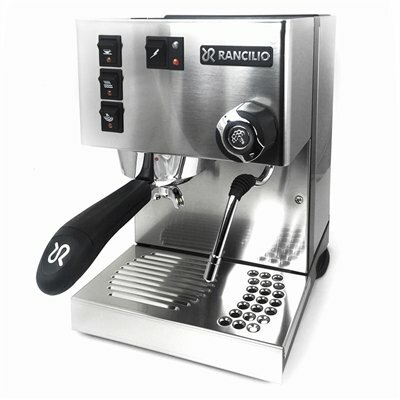 Some of the best espresso machines come from the company Rancilio, and the “Silvia” is no exception. It is perfect for coffee shops, as it can do miracles in the hands of an experienced barista. It has quality written all over it and comes at an affordable price. It slightly beats our second place winner, and we recommend it strongly. La Pavoni have a long history of making coffee machines, which heavily reflects on the exceptional quality embedded into their new model – the “Napolitana”. It exceeds its competition in aspects such as design, and build quality, although falls behind on other such as its high grinding noise and the short frothing wand. Built-in conical bur grinder and coffee press. The espresso making giant Gaggia released a newer upgraded version of their “Classic” model, which has been working without a break in most coffee shops ever since the 1980s. The new model comes with some decent upgrades worthy of its brand name which give its competition a run for its money. 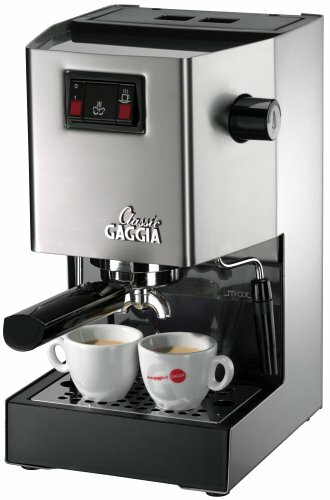 At this price range the Gaggia Classic is the perfect espresso machine for a small coffee shop, or even for home use. What Delonghi did with their “Dedica” is nothing short of incredible. 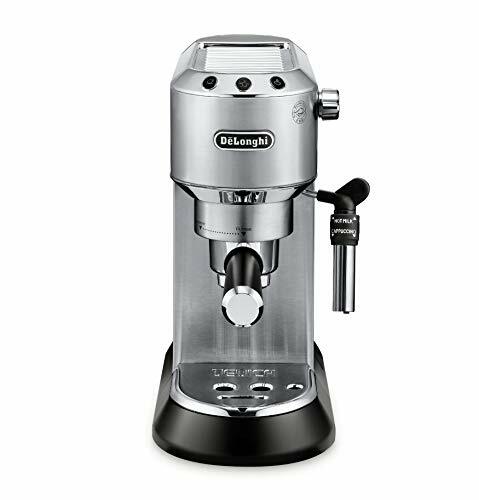 The tiny footprint combined with an amazing output quality is the reason this machine is, in our opinion, the best espresso maker for any household. It is made out of solid materials and brews coffee at just the right temperature. Ease of use and maintenance are its other main pillars of success and will make your life even sweeter. These type of machines are a leftover from a more complicated era of coffee making. Back when the manual machines were the only ones to use, baristas took far more time to prepare a single cup of coffee. A major downside here, apart from the manual labor put into making every cup of coffee, is that the quality of your coffees will be pretty much inconsistent. The reason behind that is that you are pushing the water through the machine manually and getting it exactly the same way twice can be a tough job. Having one at home, can make you appreciate the old methods of making a good, quality cup of joy. That, if you are never in a rush when needing coffee, of course. A great thing about those models, though, is that they look absolutely stunning. If you are running a coffee shop, having one of those behind the bar will surely turn some heads, even if you don’t use it for coffee making. There are some relatively cheap models, which can serve a good decorative purpose, although they are still expensive compared to their automated counterparts. These models were first introduced when electricity made its way to the coffee industry. The inventor of the first one was named Achilles Gaggia. If that name sounds familiar, you aren’t mistaken. One of the biggest coffee machine brands is named after him. Having such a machine lets you enjoy a hands-free experience. Furthermore, there is quite the number of controls over the temperature and pressure of most of these machines. That all leads to them being the most common ones on the market right now. Those are pretty much the same as the semi-automated ones, with the difference that there is an integrated software here. It does most of the job for you, by calculating the amount of water going through the espresso/capsule, and having tons and tons of preinstalled coffee programs. People with less time on their hands tend to opt for these. If you want the best possible machine for your espresso making morning routine this is it. The super automated machines have literally everything a coffee maker needs, including a built-in grinder, boiler temperature controls, pre-installed programs, and more. They are specifically great for small coffee shops, as they have a high output and require fewer eyes on them. The La Pavoni PA-200 Napolitana model we reviewed isn’t exactly on par with the “super automatic” family but is ideal for small coffee shops nonetheless. It does all the super automated ones do but at literally half their price. Let’s take a closer look at each of these aspects now. The less room there is for error, the less error there will be, but if you are going to have a coffee shop staff which will work with the same machine day after day, you shouldn’t pay attention to this aspect. Baristas usually know how to use any type of espresso machine, and even a new one won’t take them more than a day to get used to. If you are planning on getting yourself a machine for your own home, then consider getting one with a little fewer extras and useless attributes. Your money should go towards a model with quality materials and as few buttons as possible. After all, the goal here is the best possible espresso with as little hassle as possible, whereas in a coffee shop, the machine would probably have to perform other tasks, such as making cappuccinos, lattes or any other type of coffee. Having a grinder is a good thing, as it usually saves you money. There are a lot of good coffee grinders such as the Rancilio HSD-ROC-SS, but they aren’t really cheap. If you intend to have a lot of workflows, we suggest getting a separate grinder. They can grind more coffee and have larger tanks than the pre-built ones (in most of the cases). If you plan on making cappuccinos, get a machine which has a built-in milk steamer. That will most likely reflect the price but is a nice add-on in the long run. Also, one important thing to mention here is the design. Sure, if you want it to stay in a kitchen corner it wouldn’t really matter, but if you plan to place it behind a bar where people will see it daily, then you should opt for the ones with a more appealing look. If you are planning on frequent use, invest a little more into a machine built from more durable materials. Stainless steel and brass are usually the two materials of choice when it comes to a potentially long service life. A bit obvious, but you don’t want your coffee machine to be really heavy as you’ll have to eventually move it around a bit for maintenance or cleaning purposes. Have in mind that some models weight as much as 50 pounds! Furthermore, if you are already tight on space, beware of the dimensions of the model you want to buy. Trust us, espresso machines can be quite bulky. Last but not least, take the warranty period into consideration, as well as what it covers. Some warranties allow you to have damaged parts replaced, or have people come over to do maintenance checks on your machine. Usually, an espresso machine will easily last you from 5 to 7 years, but if you keep good care of it, it may serve you for a far longer period. After everything has been pretty much taken out of your way, is important that we emphasize something. 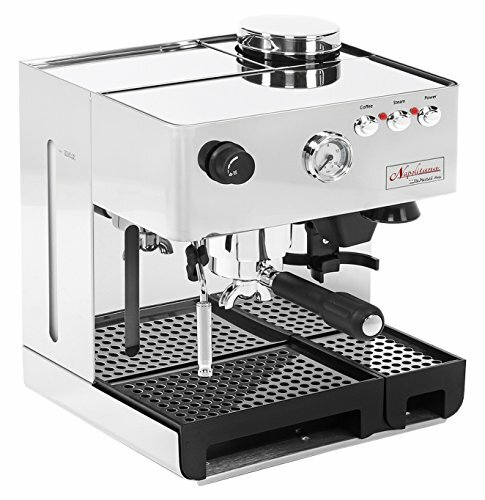 Before getting any type of espresso machine, please consider coming up with a price range which suits your needs and potential future business plans. Some of the models we reviewed can seem pricey, but on today’s market, there really aren’t any decent models below the 300-500$ price range. Consider paying slightly more for your machine, as it is basically a long-term investment. The higher the price, the better the materials, and the better the materials, the better your user experience will be. The quality and type of materials are important when it comes to product maintenance and the quality of your coffee. Some materials such as aluminum can corrode if not treated/maintained properly, and even breed bacteria in them. Having a boiler made out of brass can be hard on the wallet but is the overall best possible option for your machine. Once again, if you are planning on opening a coffee shop, or expanding an already existing one, consider buying a model with a higher output which requires less operational supervision. If you are just a coffee enthusiast who wants to make coffee at home, then every single model which you like is the perfect one for you. Lastly, something people tend to ignore is the hygiene of your espresso machine. There are various ways to clean it, and more importantly each method for each cleaning period (daily, after 1 week, after 1 month, etc. ), so let’s quickly get into that. Being responsible when it comes to cleaning and maintaining will ensure a healthy service life of your espresso machine and will almost guarantee it will outlast its estimated life cycle. All technicalities aside, cleaning your machine literally affects the way the coffee tastes. Now, let us introduce you to the whole process. This is the easiest task of them all. If you’ve used your steamer to boil up some milk, clean it up nicely with a damp towel. Make sure to release some steam to further clean it of any milk left in the nozzle hole. If that was your only coffee of the day, empty the filter basket and rinse the group head thoroughly. Leave it to dry or wipe it, so that it is completely dry before your next use. If you are planning on using the machine on multiple occasions throughout the day do the rinsing process at the end of the same day instead of each time. At the end of the day clean any leftover residue on your machine with a damp towel. Run some water through the group head and wipe the area around the group head. You can use a direct stream of water for that process if things are really bad (dirty). Going forward, tighten the filter handle and run some (low temperature) water into the group head just like making an espresso. Once again, don’t use hot water as you might get burnt. Let your machine build up some pressure for a few seconds and then release it. This is known as “backflushing”. Repeat the process until the released water is clear. Finally, remove the drip tray and the portafilter. There will be some coffee residue and the water might have a brown tint to it. Rinse the drip tray and reinstall the portafilter after carefully wiping everything up. This process is almost the same as the daily cleaning one with the difference of adding some sort of a detergent. Manufacturers usually point out how much detergent you need to pour into the portafilter basket in their instruction manuals. Just install the backflush basket in the portafilter and add the detergent. Apart from that, everything else is the same as the daily cleaning routine. For extra points, soak the backflush portafilter basket and the portafilter in water (with or without detergent) and scrub them until clean. You can do the same thing with the group head if it is removable. This step is intended to remove hard minerals gathered anywhere inside your machine. It really depends on the hardness of water used with the machine in those 4 to 6 months. After you empty the machine’s reservoir, fill it up with a descaler (as much as the instructions manual says) and just start the machine. The descaler will go through the piping and the boiler and will take care of everything. Keep the machine on for some good 20-30 minutes (with the descaler inside). After that empty the reservoir and fill it up with clean water. Rinse everything as in the previous methods and check for impurities and stains. 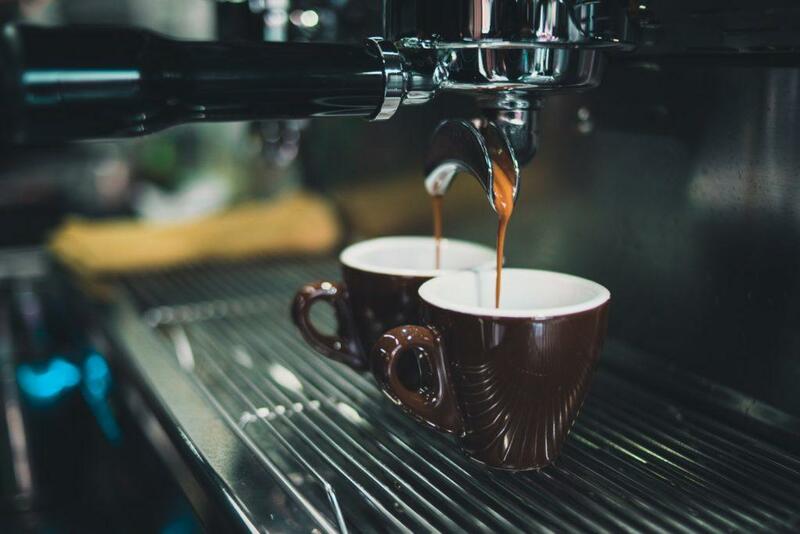 Buying the best commercial espresso machine can be challenging, but if you know which are the basic things to keep your eyes open for, it all narrows down to a few features that vary from model to model. Once again, what the final taste of the coffee is what matters the most. The model can be gold-plated but as long as it doesn’t come up with the best possible cup of coffee, it’s not worth your money. We highly suggest choosing from some of the models we’ve presented, as they have been handpicked among tons of competition, and are the industry leaders for a reason. 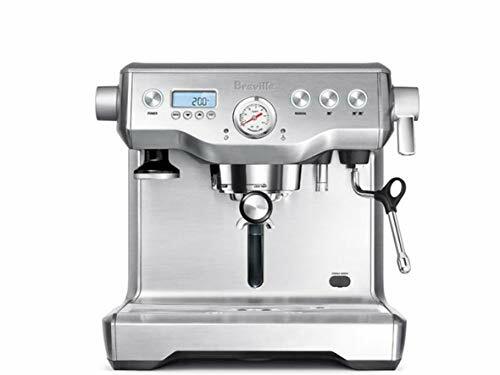 Our top pick is Breville BES920XL.